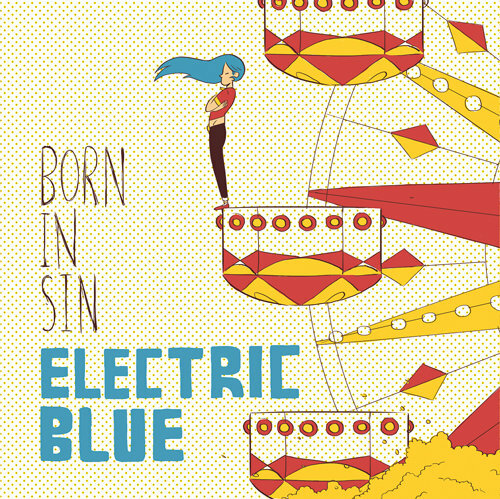 Israeli-Blues-Rock band Electric Blue offer up their debut-album experience titled ‘Born In Sin’. The new album showcases the bands’ phenomenal and pumped up blues rock style, offering what comes across as a highly enjoyable and easily accessible album experience. Electric Blue seem to have turned up everything for their debut album effort, in an attempt to show off everything they are capable of when it comes to their own branch of music within the blues rock genre. Whilst the music on the album itself derives from the rather formulaic format of blues music, everything still comes across as enjoyable and fun, giving the album a little bit of an edge. Electric Blue certainly sound like they know what they’re doing when it comes to their music, with ‘Born In Sin’ coming across as a very enjoyable album effort. Many traditional blues influences can be seen here and there, but Electric Blue seem to have injected a fair amount of their own personality into the mix, giving the music itself its own charm. There’s a lot to be enjoyed here, especially in the performance by the band, who never seem to let up at any given moment, and instead just inject very single ounce of energy they have available. It’s pure and simple blues rock at the end of the day, that has managed to do a lot right. What is a shame though is how Electric Blue don’t seem to really branch themselves out much in terms of the sound they’re offering on ‘Born In Sin’. After a while is spent listening to the album, it becomes somewhat apparent that there isn’t really going to be much of a change in the dynamics or sound on the album. Everything is loud and crunchy and whilst it is good in its own right, it is a little bit disappointing when it is the only thing being offered on the album itself. It’d be nice if ‘Born In Sin’ offered some different dynamics whilst still retaining its blues roots. It’s possible, but sadly not present on Electric Blues’ debut album. Whilst Electric Blue might have missed a few of the marks when it comes to offering their debut album experience, what they have done right has been done so well that is does present ‘Born In Sin’ as a highly enjoyable album experience. Electric Blue have set out with the intention of delivering a full-on blues rock experience, which they have managed to achieve in fine style. ‘Born In Sin’ might not have every single element available that would make it a phenomenal album experience, but it does feature enough to showcase Electric Blue as a very strong and capable blues-rock band. Electric Blues’ debut album ‘Born In Sin’ is out now.